Asia Predictions – Dr. Turi M.D.U.S. Millions of people have been amazed by the incredible work of Dr. Louis Turi. This masterpiece is no exception. 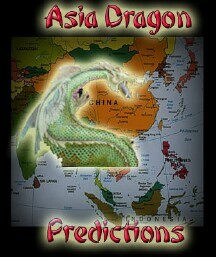 Asia Dragon Predictions is a book of predictions from which to learn what the Dragon will bring to Asian countries and their leaders. It also forecasts the fate of the US, President Bush, England, and Prime Minister Blair, and includes predictions for Saddam Hussein, Osama Bin Laden and so many more. This book contains also a table which allows you to find your own personal Dragon and it’s meaning.